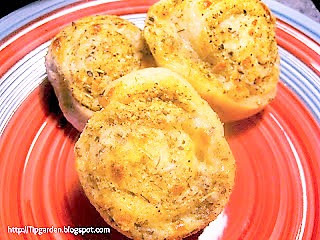 These Quick Garlic Parmesan Pinwheel Rolls are the perfect pairing with a side of soup or along side any comfort food meal, and they just take a few minutes to put together, but your family and guests will think you spent hours baking these cute and delicious treats! I love taking a simple meal and turning it just a notch on the special side. One way that I like to do that is to take a simple can of refrigerator biscuits or bread dough and turn it into something unexpected. One easy compliment to your dinner are these Garlic Parmesan Pinwheels. Using store bought pizza dough in a can that you unroll and bake, you can easily make these and have them ready to serve in less than 15 minutes. Preheat oven to 425 degrees. Lightly spray baking sheet with non stick cooking spray. sprinkle with Parmesan, garlic, and italian seasoning, and mozarella (just a little or the pinwheels will unravel in the oven). slice into 1 inch slices and lay cut side up on the baking sheet. Spray just a small spritz of non stick cooking spray on the tops of the pinwheels and sprinkle tops with additional parmesan, garlic,and italian seasoning.